It's been such a long time since I've posted a recipe, despite the fact that my camera roll is still predominantly filled with food photos (ok and dispersed with the odd Maddie snap here and there). 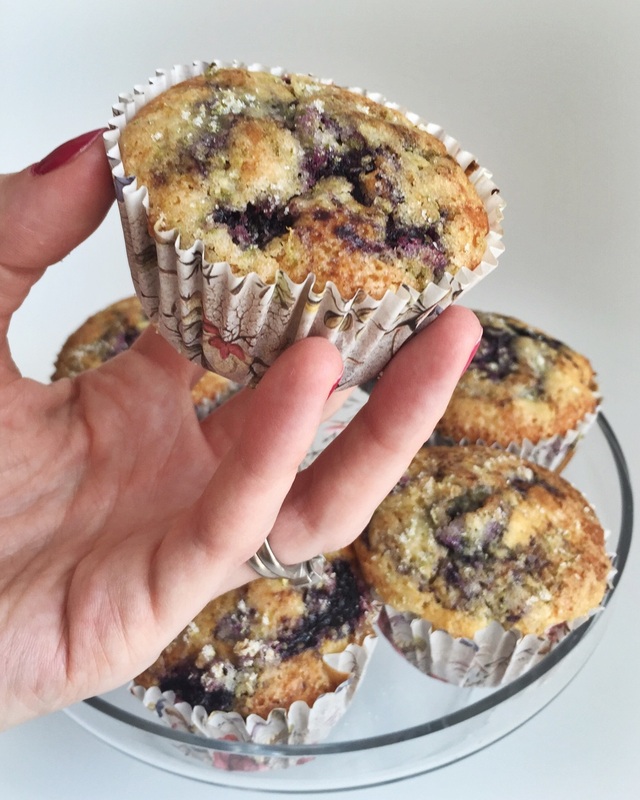 I thought these Blueberry & Lime muffins would be a perfect one to share because not only are they gluten free, but they are dairy free also, and I am discovering more and more people who seem to have sensitivities to one or both of these food groups. I was having my friend over for afternoon tea last week and realised that we are a tricky pair to feed! I've got my glutard tendencies but she is currently having to be fairly restrictive while her sweet wee baby is nursed and has an intolerance to dairy. So I found a recipe that looked doable, tweaked it a little, and was actually really darn impressed with the results! The original recipe is here. The blueberries keep the muffins moist whilst the crunchy line sugar on top gives them a sweet zing that makes them a little bit indulgent. It helps to have a good quality gluten free flour, but otherwise I really liked that this ingredient list is all items I actually know! So much of intolerant baking is filled with ingredients I've never heard of or can't find in Abu Dhabi, so keeping it simple is key for me. I made a batch of mini muffins for the little girls as well, and just omitted the lime sugar and extra blueberry swirl on top, which of course makes them a little bit less delicious, but a bit more kid friendly! And I'm kind of keen on less sugar in a 3 year old! My non-intolerant husband gobbled up three of these without taking a breath and had no clue that these were lacking my go-to ingredient of lashings of butter! I have to agree with him, it's nice to not know if you're missing out on the good stuff, so these muffins are a definite winner of you too need to watch your dairy or gluten intake. 1. In a small bowl, stir together 1/4 cup of the sugar and the lime zest. Set aside. 2. Preheat the oven to 425˚F/220˚C with a rack in the middle. 4. In a large bowl, whisk together the flour, almond meal, baking powder and salt. 5. In a medium bowl, beat together the remaining 1 cup sugar, eggs, rapeseed oil, almond milk and vanilla until smooth. Add to the flour mixture and stir until just combined. Fold in the remaining 1 cup blueberries. Pour the batter into each prepared muffin pan cup until two-thirds full. Spoon about 1 teaspoon of the blueberry compote into each muffin batter center and, using a fork, swirl. Sprinkle generously with the lime sugar. 6. Bake until a toothpick inserted in the center comes out clean, 16 to 18 minutes. Let cool on a rack before serving.